Preheat oven to 400F. Heat a medium sized oven proof casserole on medium high. Add oil and pork tenderloin to hot pan and brown all over – turning every minute or so until light brown. Remove pork from pan and add pears with juice, vinegar, mustard, and salt and whisk until blended. Add the tenderloin back to the casserole, cover, and roast in oven until pork is 160F (about 20 minutes). 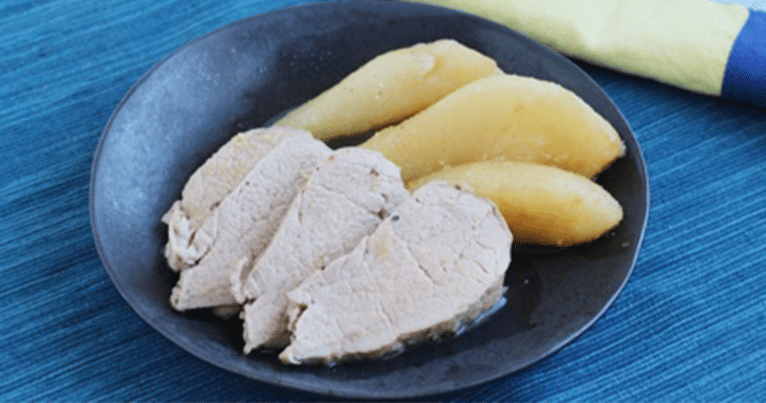 Slice pork and serve with slices of pear with juice drizzled on top. Add salt and pepper to taste.